President Trump welcomed Narendra Modi to the White House on Monday afternoon and praised him for being “such a great prime minister” of India. The US president declared that ties between Washington and New Delhi had “never been stronger” – and the pair sealed their bond with not one, but three hugs. Melania caught everyone attention with her stunning look! The first lady wore the ensemble to welcome Indian Prime Minister Narendra Modi to the White House on Monday. The bright yellow belted crepe gown by Emilio Pucci was adorned with black-and-white flowers that popped against her pink suede Christian Louboutin heels — the same pair she wore to the June 22 Congressional Picnic. 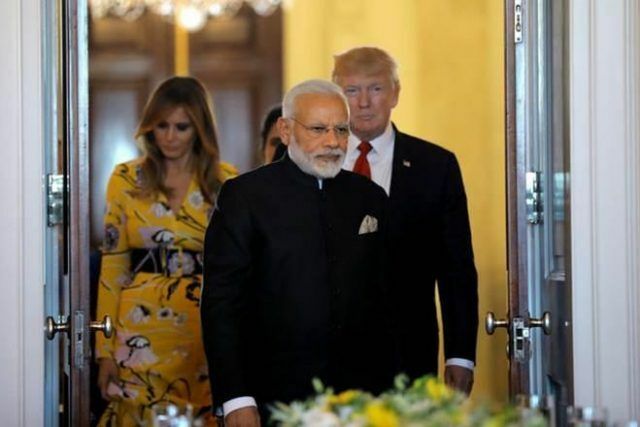 According to CNN, Modi’s first visit to the White House was a show of unity and military cooperation between the two nations despite tensions between India and Pakistan. Check out the amazing thing that Melania Trump wore today in the video below. The amazing thing is how Melania works together with her husband. Mr Modi said the two leaders had agreed to enhance cooperation in fighting terrorism – and that he had invited Mr Trump to visit India. “We want to take our strategic partnership to new heights,” Mr Modi said. Do you agree that Melania and Donald are perfect as FLOTUS and POTUS?